Alex Rivera: "Documentarians play the most crucial role when they question the official story"
The main question here: Does a filmmaker have the right, and indeed the responsibility, to tell a story as he or she sees fit, pursuing truth even when the story is not completely cut and dry? And should fellow filmmakers back a director when controversy erupts? At the recent Los Angeles Film Festival, director Fredrik Gertten’s documentary, “Bananas! *” unwillingly found itself at the center of a strange controversy. Originally programmed in competition, the festival decided to screen the film out of competition following accusations that a main figure in the film, attorney Juan Dominguez, fabricated stories in order to forward a lawsuit in U.S. courts against agri-corporation Dole over its use of Nemagon or Dibromochloropropane (DBCP), a pesticide created in 1955 and used extensively worldwide until 1977 when empolyees at Occidental Chemical in California were found to be sterile after handling the chemical. And that is the crux of the controversy. Director Fredrik Gertten said that his film, and the film festival, were being threatened by Dole and that the company had lead a campaign of deceit both inside and outside the court in order to detract the ultimate facts – that the company continued to use the presticide in its Latin American operations despite its known dangers. Gertten told iW during the festival that a Dole exec had even threatened to sue Dow Chemical, which produced the pesticide, if it did not provide the company with the chemical. This despite Dow’s own urging to no longer use the pesticide. A simmering controversy at this year’s Los Angeles Film Festival has torn at the community here, dividing filmmakers, frustrating festival staff, and frightening festival sponsors. Questions of filmmaking ethics are being debated day and night against the backdrop of potential lawsuits from one of America’s biggest corporations. The film in the eye of the storm is “Bananas! *,” a documentary which centers on Juan Dominguez, a personal injury lawyer and epic film character. As a boy, Dominguez and his family fled the Cuban revolution. In the U.S., Dominguez became notorious for having his face plastered on billboards announcing his law firm’s phone number around Los Angeles. He drives a red Ferrari and sips espresso from a gold-plated cup while filing personal injury claims on behalf of mostly Latino clients in Los Angeles. 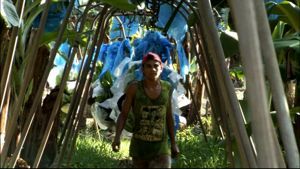 The film’s focus is Dominguez’s biggest case – by far – and a case that could pose potentially grave threats to the bottom line of many transnational corporations. Tellez v. Dole Food centers on Nicaraguan farm workers who worked on Dole’s banana plantations. In the Seventies, Dole used a pesticide called DBCP. The pesticide, which was produced by Dow Chemical, was made illegal in the United States in 1977 because it was found to cause sterility in those exposed to it. Dole stopped using DBCP in the United States, but bought all of the remaining supplies to continue use in other countries, including Nicaragua. None of these facts are in doubt, or are even contested by Dole itself. “Bananas! *” follows Juan Dominguez and his associates as they take a small group of Nicaraguan farm workers into a Los Angeles courtroom to face Dole’s lawyers, and an American jury, to demand compensation for the damages that they allege the pesticide caused to them — specifically sterility. A scene from Fredrik Gertten’s “Bananas! *” Image courtesy of the filmmaker. At the conclusion of the film – which includes much courtroom footage – the jury makes two rulings: they find in favor of most (but not all) of the plaintiffs, and they find that Dole did not do any of this accidentally. The jury rules that Dole acted “in malice,” and they award the farm workers millions of dollars. The film, which was supported by ITVS, Sundance, and many others, was finished earlier this year and accepted into competition here at the Los Angeles Film Festival where the winning documentary takes home a $50,000 prize. The screening was to be “Bananas! *” world premiere. The controversy around the documentary began a few months ago when a judge, responding to a request by Dole, threw out the lawsuits. Judge Victoria Chaney ruled that Juan Dominguez, and many of his Nicaraguan plaintiffs, were making fraudulent claims. The judge agreed with Dole that evidence of sterility was fabricated, and even that many of the plaintiffs never worked at Dole at all. The case is not yet settled. Juan Dominguez and the Nicaraguans he represents have all denied any wrongdoing and are continuing to press their case in court. However, this recent ruling caused two things to happen at this year’s Los Angeles Film Festival. The first impact was that Dole used Judge Chaney’s recent ruling as part of their campaign to discredit the film. Dole says that the film is slander, and have threatened to sue the festival for screening the film, the sponsors for supporting the festival, and the filmmaker for making the film. The first of these points is, to me, easy to understand and to settle. In Dole’s actions against “Bananas! *,” we have a case of a corporation using the threat of lawsuits to defend their image. And, while it’s creepy to see a non-profit arts organization under legal threats from a multi-billion dollar corporation, it’s pretty easy to understand everyone’s motivations and actions here: the corporation wants to protect their image and the festival has to navigate their commitment to the film and their desire to not be sued into oblivion. The festival moved “Bananas! *” out of competition, and dubbed it a “case study,” preceding the screenings with a disclaimer, and following each screening with a panel discussion, interestingly moderated by the festival’s lawyer. The reaction among the community of filmmakers, however, has been more difficult to pick apart. In informal conversations at the festival, and on some filmmakers’ blogs, this event has become a cause to ponder documentary ethics. Let’s put “Bananas! *” aside for a moment, and look at the big picture. One of the things documentarians do – often – is question the justice system. Look at “The Thin Blue Line,” an obvious example. Errol Morris uses the film to present evidence that counters a conviction a court delivered, and ultimately, by releasing the film, Morris proves the inmate’s innocence. But what if someone told Errol he should not make the film because the case was already settled? That would be absurd. Or what if Errol made the case for innocence in the film, but after releasing the film a judge disagreed with the evidence the film presented? Would he be asked to re-cut the film to square his version of events with the judge’s? Of course not. The situation of filmmakers and others pushing for a re-cut of “Bananas! *” is no less absurd. A community of filmmakers here is telling a documentarian that a court ruling should compel him to doubt his subjects, and re-cut his film. The problem here is the filmmaker doesn’t agree with the recent ruling. Gertten believes that Juan Dominguez did not likely commit fraud, that the farm workers’ cases have merit, and that Judge Chaney’s ruling must be seen as a triumph of Dole’s team of paid investigators and corporate lawyers (who produced all of the evidence of the alleged fraud, using testimony gathered from anonymous witnesses). At the “Bananas! *” premiere no one asked Gertten if he still believed in his story. When the lights went up the conversation began with the participants implicitly accepting the truth behind the new ruling from the judge, and asking Gertten how he would deal with his presumably tainted film. It would have been hard to imagine a better post-screening discussion, from Dole’s point of view – no one even mentioned the pesticide. I was bewildered, and left wondering if the group was falling into a trap: reading the Ferrari-driving lawyer who has his face on billboards as a sleazy stereotype – a mercenary trial lawyer at best and fraudulent Latino hustler at worst. One way or another, many participants were more willing to assume that Judge Chaney (and Dole) had found real fraud, than to assume that Juan Dominguez and filmmaker Gertten had found the real truth. The same day that Judge Chaney dismissed Juan Dominguez’s case against Dole, potentially saving Dole tens of millions of dollars in damages payable to Nicaraguan farm workers – that same day — she was nominated for a position on a state appellate court by Governor Arnold Schwarzenegger, and removed from her role in the case. Dole is a major donor to the Governator. Hmm. It doesn’t matter if it’s by questioning a past court decision, following an unfolding court case, or in the case of “Bananas! *,” a case that takes a turn after the film is completed, documentarians play the most crucial role when they question the official story. This belief is to me, part of the fabric of our independent film community. It’s been fascinating and frustrating to see that belief open for discussion at this year’s Los Angeles Film Festival.